Charlie Duncan and Amelia Adams of Texas Housers contributed to this post. Nearly a year since Hurricanes Harvey, Irma, and Maria damaged properties across Texas, Florida, and Puerto Rico, long-term disaster recovery efforts are under way, and the US Department of Housing and Urban Development (HUD) has started reviewing and approving state and local governments’ plans for recovery. Now that most damage assessments from last year’s disasters are completed, public assistance programs are developing criteria for eligibility. But households can be left behind during the eligibility stage of the recovery process because the damage to their homes falls below an eligibility threshold or because their repair costs are underestimated. Recovery plans can be improved to ensure low-income households aren’t disproportionately affected by repair costs after disasters. The Federal Emergency Management Agency’s (FEMA’s) Individual Assistance (IA) program covers several housing-related relief and recovery activities, including direct repair and housing programs. The maximum assistance provided to eligible households is $33,000 for disasters declared before October 1, 2017, and $34,000 for those declared after. FEMA uses property damage assessments to evaluate the need for long-term, temporary housing. For property owners, eligibility is based on the value of verified and uninsured property loss. Renters in homes with damage classified as major or destroyed are also eligible. Beyond temporary housing assistance, FEMA refers property owners to the Small Business Administration’s (SBA’s) Home Disaster Loans for access to a loan of up to $200,000 for repair or replacement costs not covered by insurance. Homeowners and renters can also qualify for an SBA loan of up to $40,000 to repair or replace damaged or destroyed personal property. SBA loan applicants must meet verified loss eligibility determined by FEMA and SBA inspectors, have acceptable credit scores, and have a demonstrable ability to repay loans. Consequently, low-income or financially vulnerable households are typically ineligible. For middle-income homeowners, qualifying for an SBA loan has potential downsides. Homeowners who qualify for an SBA loan reduce their unmet need and can find themselves ineligible for future recovery grants. After major disasters, Congress can appropriate special funds to HUD for its Community Development Block Grant Disaster Recovery (CDBG-DR) program, which allocates funds to state and local governments to design and execute programs for long-term housing recovery. Congress appropriated these funds to HUD for the 2017 disasters twice: $7.4 billion on September 8, 2017, and $28 billion on February 9, 2018. The eligibility guidance for the first allocation and just-released second allocation of funds limited their use to jurisdictions that had FEMA IA designations and places that had high concentrations of damage and unmet need. 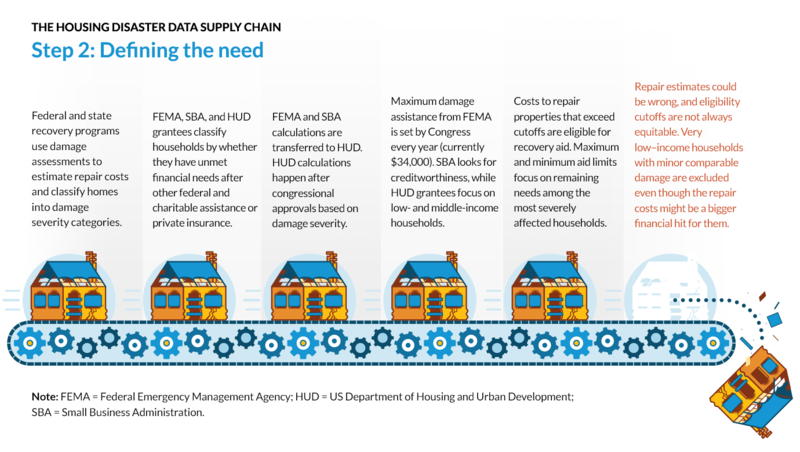 Estimates of unmet housing needs for each house in those areas are calculated using FEMA’s IA damage assessments and the SBA’s estimates of the costs to fully repair the homes, after accounting for private insurance, FEMA, and SBA assistance. HUD then uses FEMA data to categorize households into categories based on ownership type and jurisdiction. Only homeowners and renters whose units are classified as “major-low,” “major-high,” or “severe” are included in the unmet needs estimate. prioritize the lowest-income households with their recovery. But, like with damage assessments, there are opportunities for inaccuracy and omission. As identified by the Texas Low Income Housing Information Service after Hurricane Harvey, the unmet housing needs calculations adopted by Texas, which follow the same guidelines HUD uses to estimate need, do not account for the disproportionate burden that damage costs have on low-income households. For example, the minimum thresholds for having “severe unmet needs” for anyone making less than 120 percent of the area median income are $8,000 in remaining damages for homeowners and $2,000 for renters. But the shock of $1,999 in remaining damage for a very low–income renter is proportionally greater. The likelihood of these families having sufficient savings or other assets to cover that damage is also lower. By varying the minimum thresholds based on income levels, the state and other recovery grantees could allow for more low-income households—especially families making less than 80, 50, or 30 percent of the area median income—to be factored into the recovery plans. Areas with higher concentrations of these households would also benefit from the recovery more than current plans allow. States must plan local programming and eligibility process for the nearly $28 billion in additional funds that were just allocated for last year’s disasters. With $18.5 billion remaining to be programmed in Puerto Rico alone—the largest recovery grant ever from HUD—the resources are there. But demand is also high. As wildfires spread across California, the debate over who is eligible for assistance and how valuable that assistance might be for different households will rage on. Chris Ginter (R) offers Mehdi Alami (L) a ride from his flooded home in his monster truck on September 6, 2017 in Houston, Texas. Photo by Justin Sullivan/Getty Images.